The circumcircle of a triangle is the circle that passes through all three vertices of the triangle. 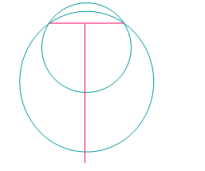 The construction first establishes the circumcenter and then draws the circle. circumcenter of a triangle is the point where the perpendicular bisectors of the sides intersect. This page shows how to construct (draw) the circumcircle of a triangle with compass and straightedge or ruler. This construction assumes you are already familiar with Constructing the Perpendicular Bisector of a Line Segment. The image below is the final drawing above with the red labels added. Note: This proof is almost identical to the proof in Constructing the circumcenter of a triangle. 2 Circles exist whose center lies on the line JK and of which AB is a chord. (* see note below) The perpendicular bisector of a chord always passes through the circle's center. 4 Circles exist whose center lies on the line LM and of which BC is a chord. (* see note below) The perpendicular bisector of a chord always passes through the circle's center. 5 The point O is the circumcenter of the triangle ABC, the center of the only circle that passes through A,B,C. O is the only point that lies on both JK and LM, and so satisfies both 2 and 4 above. Depending where the center point lies on the bisector, there is an infinite number of circles that can satisfy this. Two of them are shown on the right. Steps 2 and 4 work together to reduce the possible number to just one. Click here for a printable worksheet containing two triangle circumcircle problems. When you get to the page, use the browser print command to print as many as you wish. The printed output is not copyright.